Last October when we moved in to our new house, B's room was already a yellowish beige and we kept it that way but I quickly began to hate the color, it was too yellow and his furniture just didn't pop with the wall color. No matter what frames, art, furniture I added I felt like it just didn't look good. I knew I wanted a soft grayish color and we went with Screen Gray by Sherwin Williams and we are very happy with the results. It took the room from boring and dull to cozy, bright and cool. Truthfully, at first I thought the color was too dark and too blue, if you follow me on Snapchat, you know I went back and forth for two days. Apparently it was just the lighting in the room and the certain wall we had painted. Once my husband painted the rest of the bedroom I loved it and we kept the color. It honestly looks so good, it's quickly becoming my favorite room in the house. I wanted to redecorate the room but still use most things I already had. 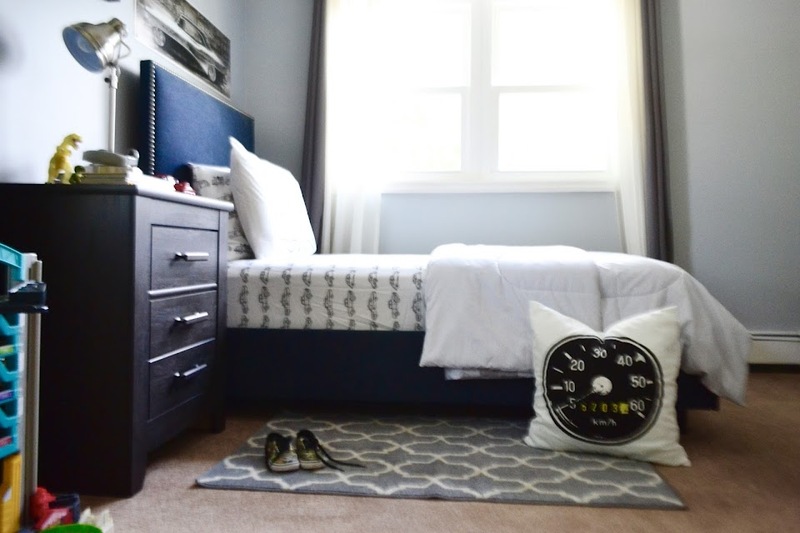 We kept the big furniture pieces, like his navy blue upholstered bed and his light gray dresser. 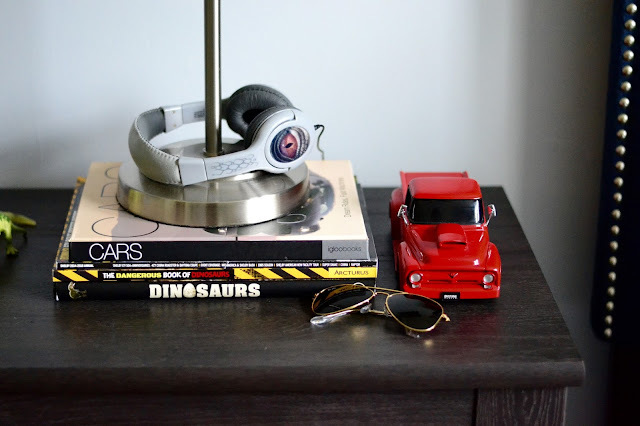 We added this really nice dark gray night table I found at Big Lots, and I loved how it tied in to the wall decor so seamlessly. 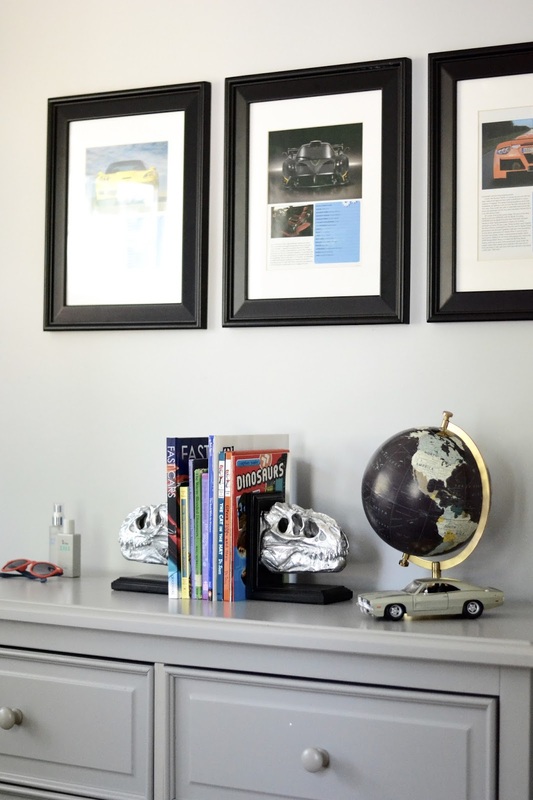 It's big enough to store some Hot Wheels and even some of his toys in the drawers and cool enough to match the room perfectly. It's a dark grayish wood and I love it. I feel that you don't have to be matchy-matchy in order to have a coordinating room. It's all about being creative and having a clear mind about what you want. 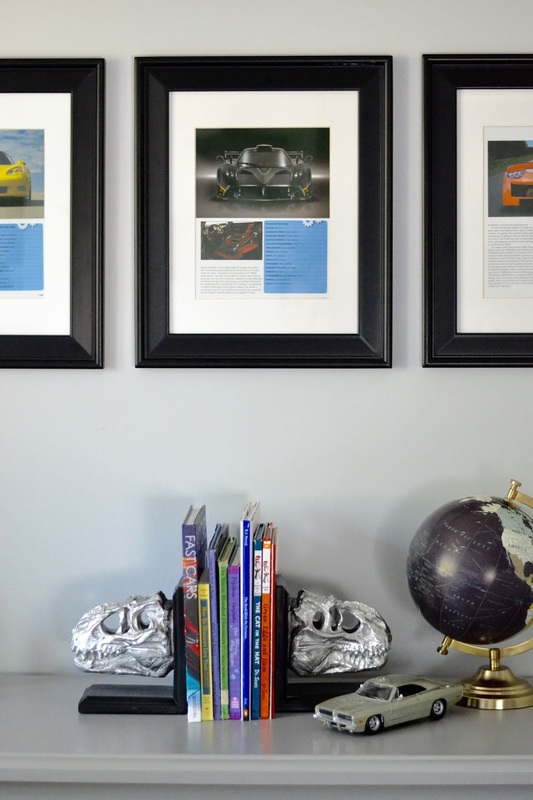 As far as the wall art, I knew I wanted to add some cool cars pictures that I knew B would love. 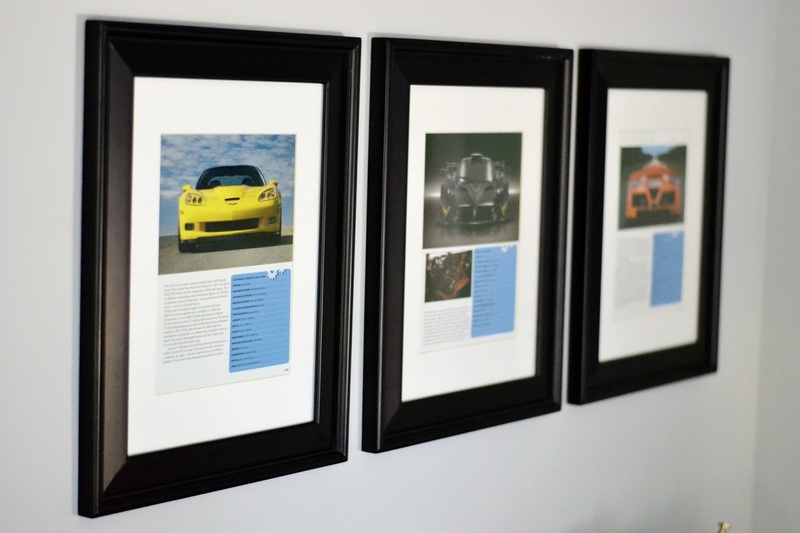 I didn't want to spend too much money on wall art as they can get quite expensive and I needed more than one. So I got creative... initially I added pictures from a calendar we got at a car show... but I wasn't 100% happy with it. Then I had the idea of looking through one of his luxury race car books and voila! I found the perfect wall art! 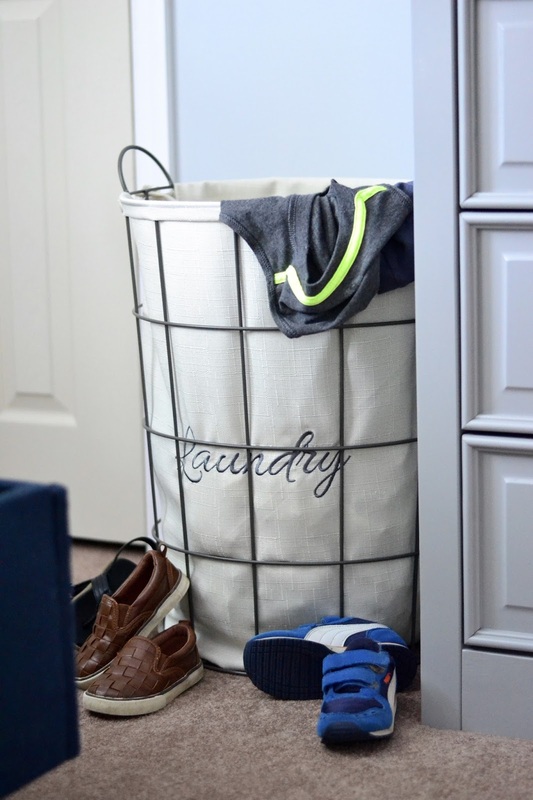 This is such a cool and simple way of saving money and making the room your own. 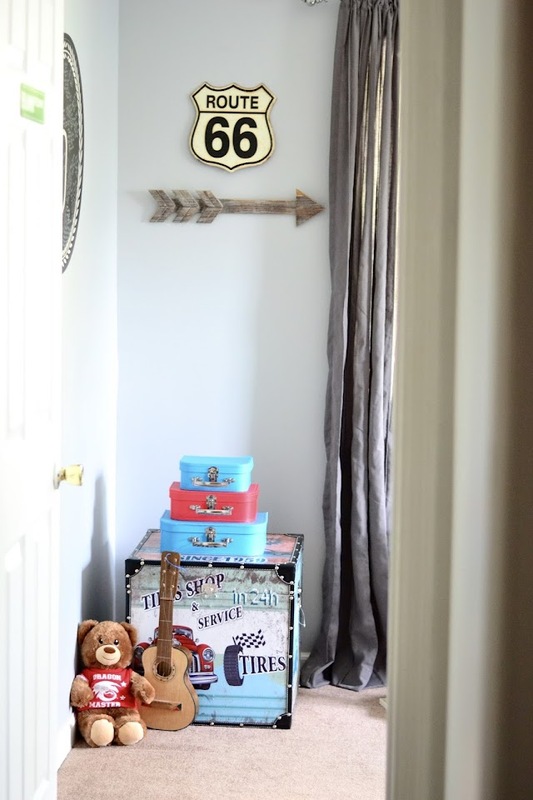 If you love DIY projects, I definitely recommend thinking outside the box, I love the final result, it's unique, it's cool and goes perfectly well with the style I was going for. Ben was so happy when he saw them hanging on his wall and I was happy I picked out good cars that he (...and my husband!) love. 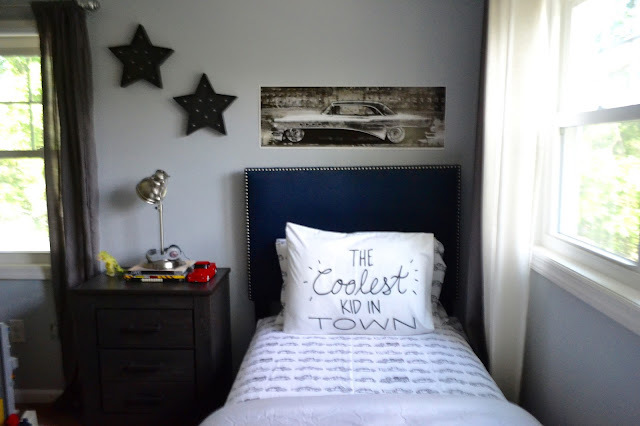 I also added these black marquee stars above the nightstand and the cool black and white car picture above his bed brought that side of the room together. I love that the room feels cozy and cool but still appropriate for his age. I feel like it's a room that will grow with him and I couldn't be happier. 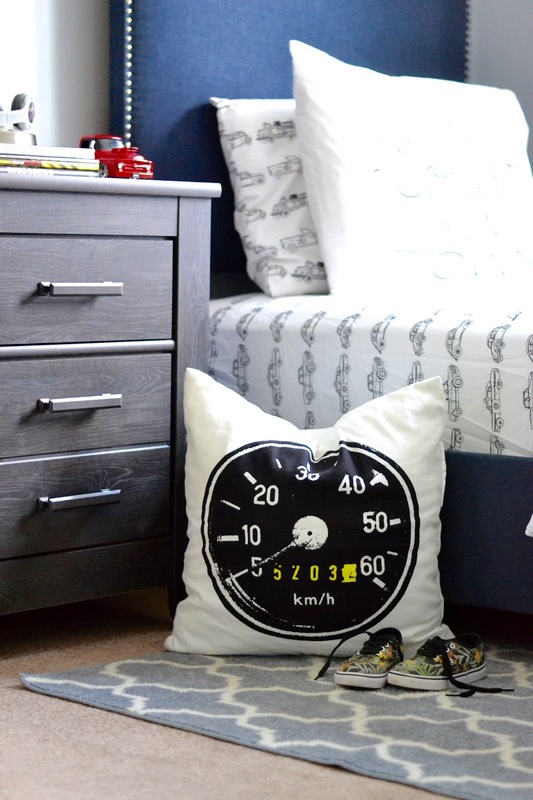 Of course I added little textured details to bring the entire room together; the printed gray rug adds the cozy factor, the odometer pillow from Ikea is the cherry on top for his black and white linen set. 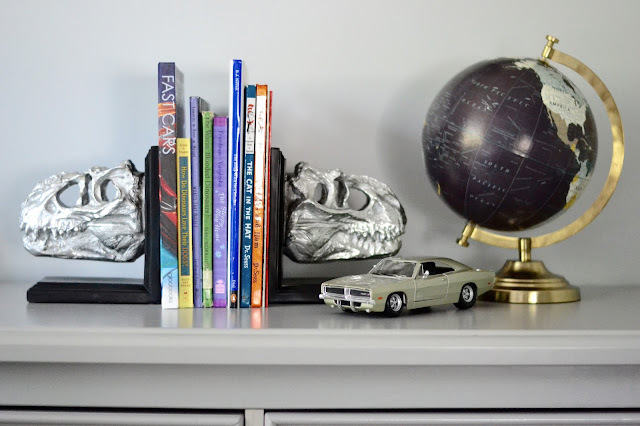 The metal lamp brings a cool element to the mix of textures and metals around the room... and of course I had to add those amazing dinosaur skull book ends from Home Goods. He holds a very special place in his heart f(and brain!) for dinosaurs so I figured it would be cool to add this too and make the room very him. I love mixing metallics; both gold and silver throughout my home. From the silver book ends, to the laundry basket and the gold globe on his dresser... It makes each room unique and inviting at the same time. We added some model cars he already had, around the room and also used some of his books as decoration. If you are redecorating any room in your home, I recommend you have a clear idea of the theme or color scheme you are going for. Think of ways to make the room unique and very yours or in this case very theirs. I wanted the room to scream BEN and I think I accomplished that. It's laid back, cool and very warm. Add thoughtful touches, recycle pieces and use them in different ways than you normally would. And most importantly have fun with it! I hope you guys loved this room tour!